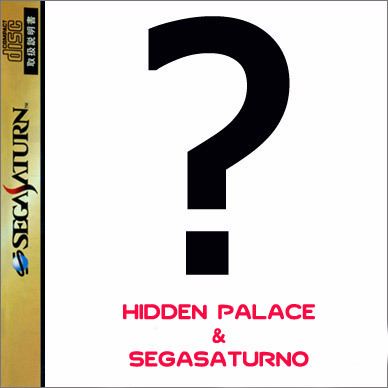 Almost two months after our last release, SEGASaturno, in cooperation with Hidden Palace, is back again presenting a prototype of another unreleased game, ready to be released as soon as the required public donations are met. One of the reasons to be present in these boards is doing joint releases with Hidden Palace, as was stated some time ago. This is truly the first time both forces shared their efforts, as this prototype was bought half-to-half by Hidden Palace and SEGASaturno, joining economic capabilities in order to bring more interesting stuff. -Is this an unreleased game for the Sega Saturn? -We won't tell yet. This time it's a surprise. -Why don't you tell which game is this? -There's a charm in mystery you'll like for sure, and it's innovative since it's not the usual procedure. Besides, we have our own reasons. -It's from a famous company. In fact, it's one of the best and most well known videogame companies. -It's a totally unreleased game, not available in any other platform. Therefore, it's a never-seen-before game. -When it will be known which game is this? -As soon as the target amount is fully reached through donations, the game will be revealed and released to the public. -Why donating for a game I don't know which one it is until the required quantity is met? -Because you already know it is an unreleased game for the Sega Saturn, something that is not easy to obtain. I bet there's an interest in making something like this available to everyone. -No, it's an early prototype. This is not in its final development stages for sure. -How much do you need to make this prototype public? -Although drx and us have paid much more for the prototype, we need to cover $550 at least to make it public. -Will this be a game bound to change my life and perception of the videogame industry? -I guess not. It's an unreleased game which doesn't have any playable representation available to the public, so it's, once again, about the preservation of a part of history of this console and the videogame industry as a whole. Of course, Sega Saturn fans in particular will be happy to have something new for their favourite console. -If I donate for this prototype, am I also helping to the possibility of further prototypes being announced for a release in the future? -For sure. Your good answer in the community releases always help us to keep actively looking for new stuff for different platforms and make them available to you in these very same conditions. Donations have to be sent to thedrx@gmail.com, stating SATURN in the description and your nick so we can know for sure the funds are oriented to this release. Thanks in advance for your cooperation, as always. Kind regards. Casi dos meses despues de nuestra ultima release, SEGASaturno en colaboracion con Hidden Palace vuelve de nuevo a presentaros otro nuevo prototipo de un juego unreleased listo para poder recibir donaciones publicas y ponerlo a vuestra disposicion. Uno de los motivos de estar tambien en este foro de drx es la posibilidad de realizar releases conjuntas con Hidden Palace, como ya comentamos. Esta sera la primera, se trata de un prototipo que ha sido comprado a medias entre Hidden Palace y SEGASaturno. Uniendo esfuerzos economicos para poder traeros mas material interesante. -¿Es un juego de Sega Saturn unreleased? No lo diremos, esta vez será una sorpresa. -¿Por que no decis que juego es? Creo que tambien tiene su parte de misterio que sin duda os gustará y es innovador, ademas tenemos nuestros motivos. -Bueno, ¿de que compañia es? ¿alguna pista? Es de una compañia famosa, una de las mejores y mas conocidas casas de videojuegos. -¿Ha salido en alguna otra consola o sistema? Es un juego totalmente unreleased. No esta disponible en ninguna otra plataforma. O sea un juego exclusivo y nunca visto. -¿Por que donar para un juego que no sabre cual es hasta que alcancemos la cifra requerida? Porque sabes que es un juego unreleased de Sega Saturn, nada facil de conseguir y que apuesto a que interesa que entre todos podamos hacer que este disponible. No, es un prototipo. El juego no esta en sus stages finales de desarrollo. -¿Cuanto necesitais para poder hacerlo publico? Aunque drx y nosotros hemos pagado bastante mas, necesitamos cubrir al menos 550 dolares para hacerlo publico. -¿Sera un juego que cambie mi vida y percepcion del mundo de los videojuegos? Supongo que no. Es un juego unreleased del que no hay nada jugable liberado, asi que no deja de ser preservar una parte de la historia de este sistema y del mundo de los videojuegos en general. Por supuesto a los fans de Sega Saturn estaran muy satisfechos de tener algo mas para su consola preferida. -¿Si dono para este estoy ayudando para que salgan otros en un futuro cercano? Por supuesto. Vuestra buena respuesta en las releases comunitarias nos anima siempre a buscar con mas ganas nuevo material de diversas plataformas para poder ponerlo a la disposicion de todos de la misma forma. Podeis enviar las donaciones desde vuestra cuenta paypal a thedrx@gmail.com poniendo en la descripcion SATURN y vuestro nick para que sepamos hacia que release van destinados esos fondos. Si no teneis cuenta paypal y quereis hacerlo por transferencia bancaria u otro metodo, poneros en contacto con nosotros que os daremos los detalles. Gracias por vuestra colaboracion, como siempre. Un saludo. Last edited by Ryo Suzuki on 13 Nov 2009, 16:40, edited 4 times in total. 2.) Has the game been displayed in media form before (magazines, videos, screenshots, etc). I know you said "It's an unreleased game which doesn't have any playable representation available to the public", but I'm talking about in the form of media besides a playable demo. 3.) Can it run in SSF (or any emulator for that matter) without any problem? Thanks for all your hard work. You guys have been a super addition to the community. 2.) Yes, was displayed in media form before. 3.) Yes, you can run it. Ahí van mis primeros 30 Dólares. Thanks again! With supporters as you, everything will be possible. Come on people, SEGA SATURN SHIRO!!!!! I updated the original thread with some donations that I received. $130 so far, not bad. It's obvious everyone is skilled enough to try to figure this by doing questions and arranging possibilities according to the answers. Seriously, don't go that way. It's an unreleased Sega Saturn game, and I believe that's a great thing already (if I'm not mistaken, Sega Saturn prototypes are not the usual thing to be dumped). It's up to the community to keep these kind of stuff going forward. And it's up to everyone doing their one's bit. I don't know which one you are thinking about, but you may be mistaken cause this has been a secret the whole time, so it would be strange you would know anything about it. Besides, none said drx has done this purchase. Why this couldn't have been bought by SEGASaturno? Donated $25 for great justice. Well can you at least state it isn't 2 particular titles (MD or WW)? Why I ask is that I want to contribute (say $50 as I love my saturn protos) but don't want to chip in for something I already own (and paid way less for than the fundraiser target). Alternatively, if you don't wish to answer that (understandable I suppose if you're afraid of someone beating you to the dump (not an option for me though)) if I chip in can I get a guarantee of a refund if it does turn out to be either of those? Don't wanna pay again for something I have, times are tough lol. Last edited by wheelaa on 12 Nov 2009, 07:23, edited 1 time in total. Looking forward to discover, play and share this new unreleased. Just one question. was there a release date if so can you say if not wot year. I updated the donation list. $390 collected so far. Thanks to everyone for the donations. I have corrected the remaining amount: it's $160 left now, not $260. Just one question that I would like to know is this beta playable? It's been said it's an early prototype, but I would find it hard to believe that if the game wasn't even playable in the slightest sense that they'd completely omit any mention of that. The prototype is playable, definitely.